churches, restaurants and medical facilities. Fishing and boating are nearby on the Manatee River. Residents enjoy social activities at the spacious community room as well as the convenience of laundry facilities on-site. Each apartment is on the ground level and offers modern conveniences and plenty of storage. From their front porch or rear patio, residents bask in outdoor living while enjoying the opportunity of the companionship of friends and neighbors just next door. 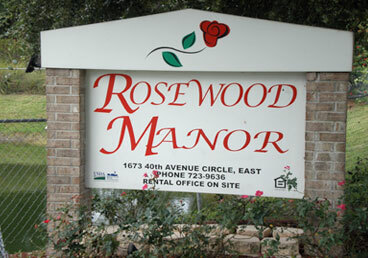 Our Professional Management Staff is waiting to assist you in making the move to your new home at Rosewood Manor Apartments. Pets are allowed with an additional $300.00 Pet Deposit.